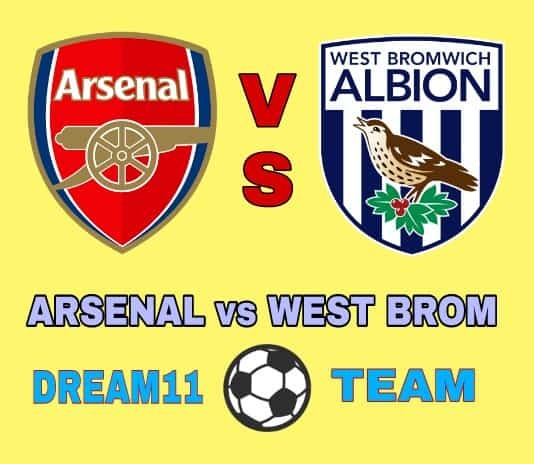 Hello welcome to our Arsenal vs West Brom Dream11 Football Team Prediction. We cover arsenal vs West Brom team news, probable lineups/playing XI and Dream11 Football Team Prediction. Mesut Ozil is in contention to return to the Arsenal team for the match. The Germany midfielder returned to training after struggling with a knee injury. Theo Walcott should be fit despite suffered injuries against Doncaster. Arsenal’s missing Players are Danny Welbeck (groin), Francis Coquelin (hamstring) and Santi Cazorla (ankle) and Calum Chambers. West Brom Albion : Oliver Burke, Nacer Chadli and Chris Brunt remain Doubts for the West Brom side. While jack Livermore is expected to back being given a Break by Tony Pulis. 1. Arsenal Have won their last 6 home match against West Brom Albion in all Competitions. 2. Arsenal Have cleansheet in 5 out of 6 home match against WBA in all Competitions. 3. Arsenal Scored at least 3 goal in their last 3 home match. 1. If you go with 3 defenders then take Ozil/Ramsey in midfielders. 2. Others Captain and Vice-captain choice are Ozil, Cech and Lacazette. 3. Arsenal Have kept clean sheet in 5 match of their last 6 home match against WBA in all Competitions, so Arsenal Cleasnsheet Dream11 team is also good. If you liked Arsenal vs West Brom Albion Dream11 Football Team Prediction, then please subscribe to our Email Newsletter For Latest cricket News, Fantasy Previews, Playing XI and All information about Dream11 Fantasy Football. You can also find us on Twitter and Facebook.